Ep. 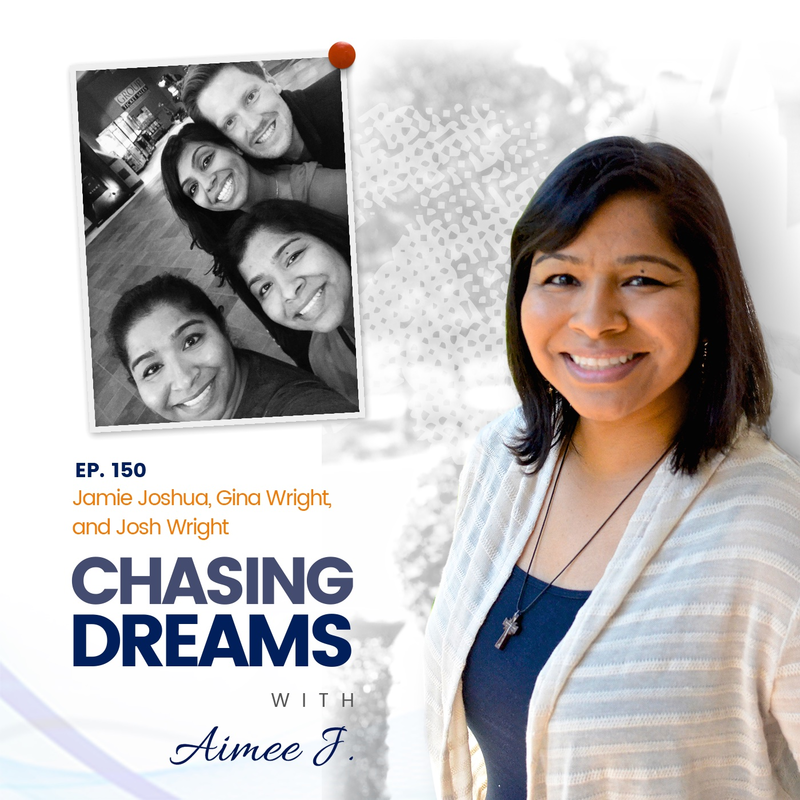 150: Jamie Joshua, Gina Wright & Josh Wright – A Chat w/Aimee J.’s Family | Aimee J. How have your dreams played into what you have accomplished in life? For some people, their dreams remain unchanged over the years, and others see their dreams take detours and U-turns as life progresses. In celebration of our 150th episode, I’ve invited some of my beloved family members to join us for a chat about their lives and how they’ve chased their dreams. I want you to meet my sister Jamie Joshua, my sister Gina Wright, and my brother-in-law Josh Wright. I’ve assembled them from across the globe for this virtual chat in which there is no script and there are no prepared questions. Let’s have fun getting to know them and putting them on the spot as only a sister can do. We start by getting their take on the world of podcasting and some of their favorites that they listen to regularly. I’m even sharing some of my newfound faves, so listen closely for one or two that you might want to catch also. A common thread among my siblings is the desire to help people and make an impact. You hear that passion as they share their occupations and if that career has truly been the one of their dreams. Jamie is Director of Diversity Inclusion at the Samuel Curtis Johnson Graduate School of Management at Cornell University. It’s not something she imagined herself doing in her former life as an attorney, but it allows her to help people and make a deeper impact. She says it’s fun to work with a variety of people who have the passion to be change agents in the world. Josh is a dentist at Cornerstone Dental, as is his wife, Gina. Josh started the practice with his brother, and their goal has always been to elevate dental care into a less fearful experience. He has wanted to be a dentist since 8th grade, and even though there have been detours along the way, he has kept his constant vision. He loves establishing relationships with his patients and not just running them in and out of the chair. Gina always wanted to be a doctor, but ended up a dentist. She likes the hands-on approach of dentistry and finds great pleasure in helping people with their smiles. Jamie works with people who are interested in using education to help them figure out their dreams. She loves being the person to remind them of those dreams. Josh sees patients ages 1-98, but he says part of his fun in dentistry is seeing kids grow, develop, and chase their dreams. Gina sees younger staff in their office who want to learn and make their dreams come true. Most of them are in the work because it’s a career they love, and not just a way to make a living. With busy and demanding careers, it’s vitally important to have other interests that bring joy and peace. Jamie likes to see movies, collect comic books, and spend quality time with friends. Gina has a lifelong passion for calligraphy and is always seeking to do new things with lettering styles. She says it’s a great stress release and gives her a way to make things for people, who are always appreciative of her efforts. Josh gravitates toward woodworking projects like spice racks, wooden pens, and cutting boards. Sometimes he and Gina collaborate on a special project that includes his woodworking and her calligraphy. To the people who think they can’t take on a hobby or don’t have time for self-care interests, they give the following advice: Josh says it comes down to making time for dreams with small, manageable steps; Jamie says you should learn to multitask in small batches of time and always make time for self-care; Gina’s advice is to be a little selfish in taking care of yourself and don’t compare yourself to others. It’s about the progress and the journey you can take joy in that matters most.